In the Microsoft 365 Business Admin center, choose Devices > AutoPilot. On the AutoPilot page, choose the Profiles tab > Create profile. 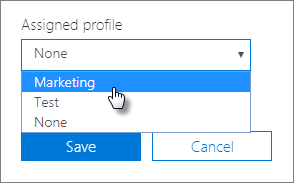 On the Create profile page, enter a name for the profile that helps you identify it, for example Marketing, turn on the setting you want (see About AutoPilot Profile settings for more information), and choose Save. After you create a profile you can apply it to a device or a group of devices. 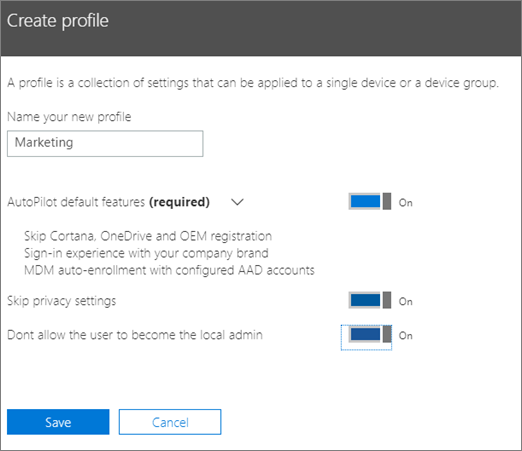 You can pick an existing profile in the step-by-step guide, you can apply it to new devices, or you can replace an existing profile for a device or group of devices. On the Prepare Windows page, choose the Devices tab. Click the check-box next to a device name and in the Device panel, choose a profile from the Assigned profile drop-down > Save. Once you've assigned a profile to a device, you can update it, even if you've already given the device to a user. When the device connects to the internet, it downloads the latest version of your profile during the setup process. If the user restores their device to its factory default settings, the device will again download the latest updates to your profile. On the Prepare Windows page, choose the Profiles tab. Click the check-box next to a device name and in the Profile panel update any of the available settings > Save. If you do this before a user connects the device to the internet, then the profile gets applied to the setup process. Click the check-box next to a device name and in the Profile panel click Delete profile > Save. When you delete a profile, it gets removed from a device or a group of devices it was assigned to. Click the check-box next to a device name and in the Device panel, choose a None from the Assigned profile drop-down > Save.